However, today I woke up and found a few emails in my inbox from readers, asking me if I ever heard about the Steelsring Nikon F to Fujifilm X smart adapter. So I figured out that in this case, it might be useful to share a reminder, since you might have missed it…. repetita juvant, as they say. 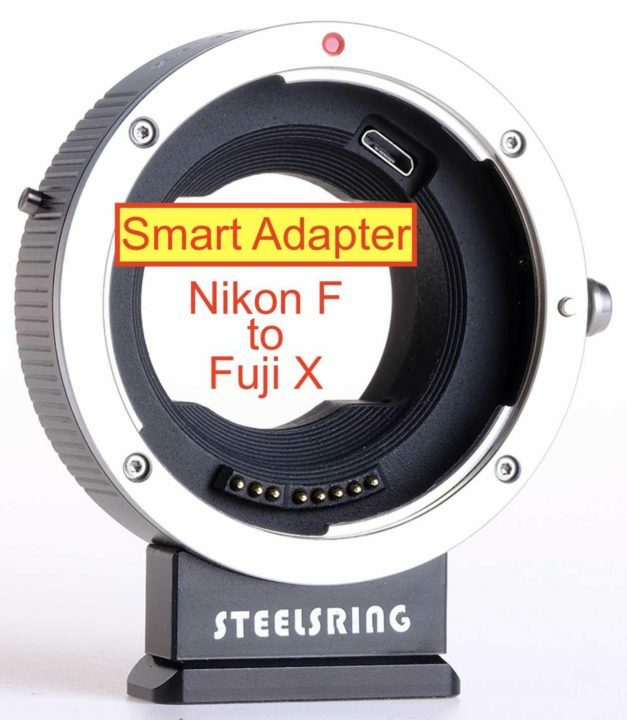 We reported back in May, that the Nikon F to Fuji X (as well as Nikon F to Fuji GFX) smart adapter is in development. Then, last month here, we showed you a first video demo of the GFX to Nikon F smart adapter version. You can check out more at steelsring here. If this adapter works well, then this could help to keep up the migration from Nikon to Fujifilm, which Nikon is trying to stop with the Nikon Z6 and Nikon Z7 (about time, Nikon!). Nikon users could continue to switch to Fujifilm and keep some of the Nikkor lenses they grow fond to. But I am pretty sure that once they enter and meet the Fujinon XF lens system quality, selling their Nikkor glass will become much easier than they would think ;). Lots of other news, but also TONS of exciting rumors are coming… NOW! Make sure not to miss them hit the bell on the bottom right of your browser, to get instant browser notifications. It’s been very busy with rumors over here in the last weeks and months, so I coudn’t share as many miXed zones as I want. But today I will try to catch up and share a major camera roundup. A big “thank you” to all of you guys, who contact me and share your content with me… you keep this roundups alive and interesting, and I am always happy to support your work by featuring you on FujiRumors.com. The Fujifilm community is simply the best, and I will do my little part in this community, by sharing your work for as long as FujiRumors will run :) . The Nikon Z6 and Nikon Z7 have been announced and are now available for pre-order. So how do Nikon’s new mirrorless cameras compare to Fujifilm’s offering? Well, I have created a comprehensive specs comparison, and included also the Fujifilm X-T3 and Fujifilm GFX 50R to the list. While we know a lot about the Fujifilm X-T3 and I can already insert lots of specs in the list, we know not so much about the GFX 50R. However, it should have about the same specs of the GFX 50S, just in another form factor (rangefinder) and for a much cheaper price. So there won’t be big surprises with the GFX 50R. Both Nikon’s are surely very good cameras. 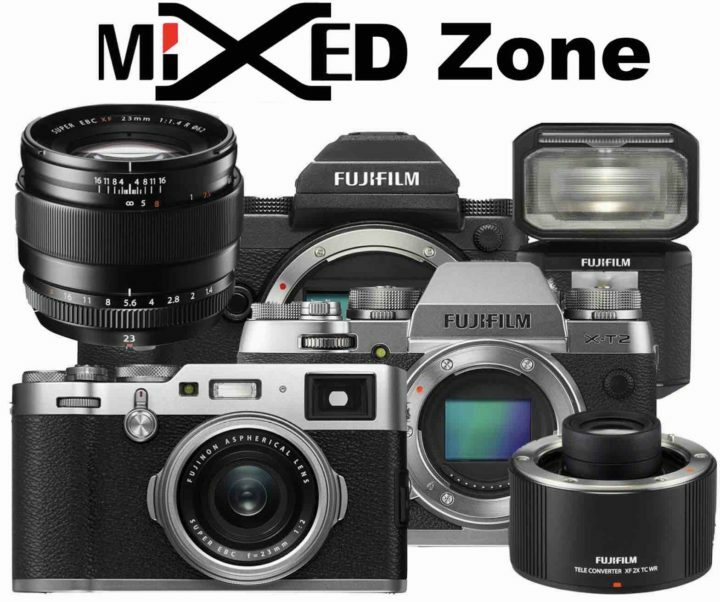 There are many specs to love, but also some, that might not really incentivize Nikon DSLR shooters to switch to Nikon mirrorless Z6 or Z7. But as said, Nikon did lots of other things right. Check out the Nikon Z6 specs at BH and Nikon Z7 specs at BH. 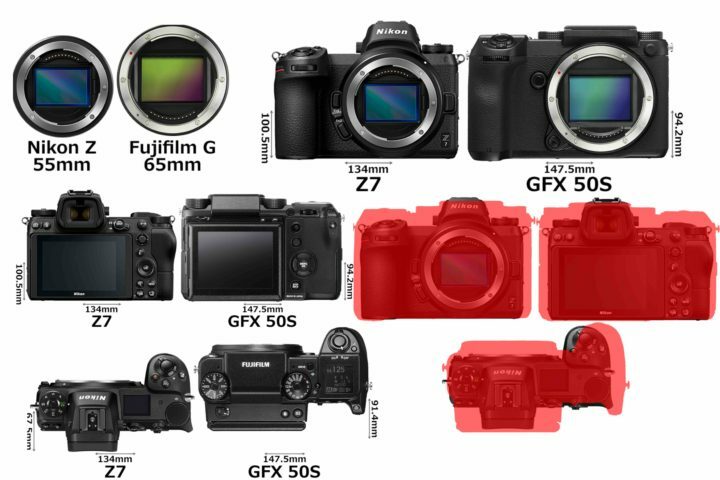 Down below you can find the complete Nikon Z6/7 Vs. Fujifilm X-T3, X-T2, X-H1, GFX 50R and GFX50S comparison. 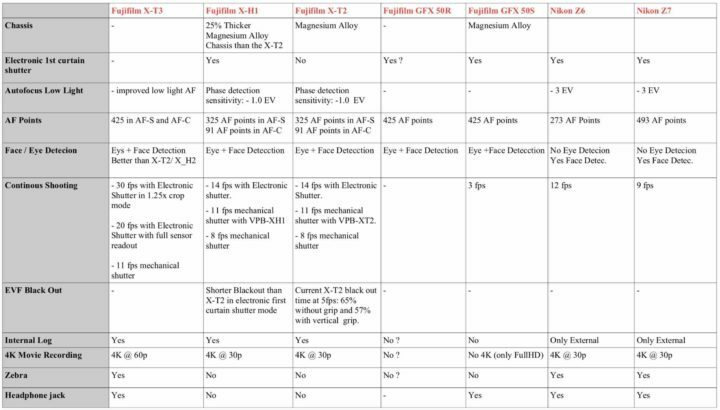 If you prefer, download the PDF comparison file form our dropbox. Also, Camerasize has now the Nikon Z6 and Nikon Z7 in their database. You can compare it to all the cameras you want at camerasize here. 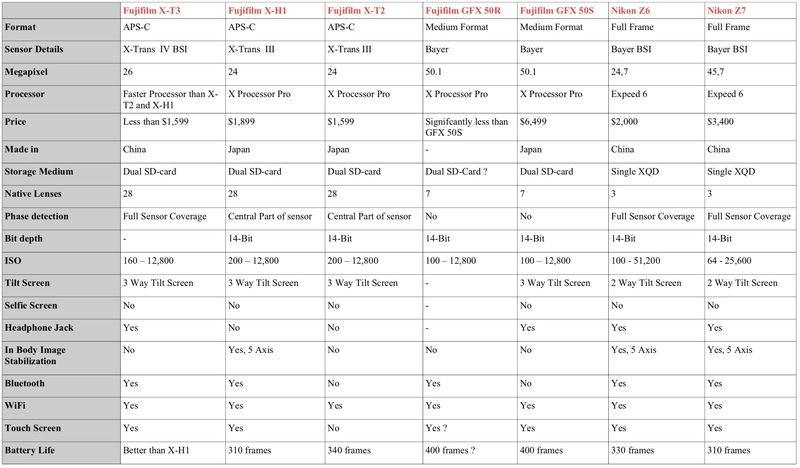 The Fujifilm GFX 50S vs Nikon Z comparisons can be found at photosku. Don’t miss the X-T3 Live Blogging and follow us on Facebook, RSS-feed, Instagram and Twitter and to allow push notifications (click bell icon on the bottom right of your browser). 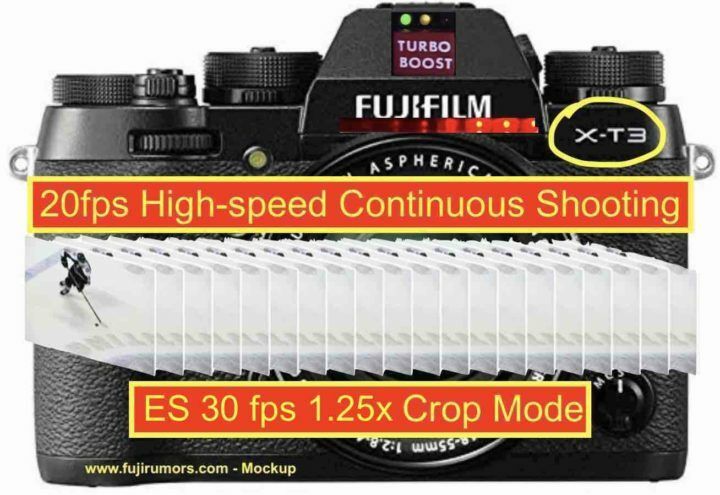 A few weeks ago, we shared here on fujirumors that the X-T3 will shoot 20 fps bursts and even faster in “crop mode”. Now we have some more details about the continuous autofocus shooting on the X-T3 (thanks). As a reference, the X-T2 and X-H1 shoot 11 fps with MS and 14fps with ES. The Sony A9 shoots at 20 fps ES. In terms of speed and features, the Fujifilm X-T3 seems to benefit a lot from the new processor and sensor. Check out the full list of specs and features below. Then make sure to join us on Facebook, RSS-feed, Instagram and Twitter and to allow push notifications (click bell icon on the bottom right of your browser). Yesterday you guys asked me in the comments, if the Fujifilm X-T3 will have a flippy selfie screen like the Fujifilm X-T100. Well, according to our trusted sources, there is no selfie screen on the X-T3. I am sure the headphone jack will make videographers happy (and overall the video specs, which we shared here). I don’t know what you guys think about the exposure compensation dial, though. 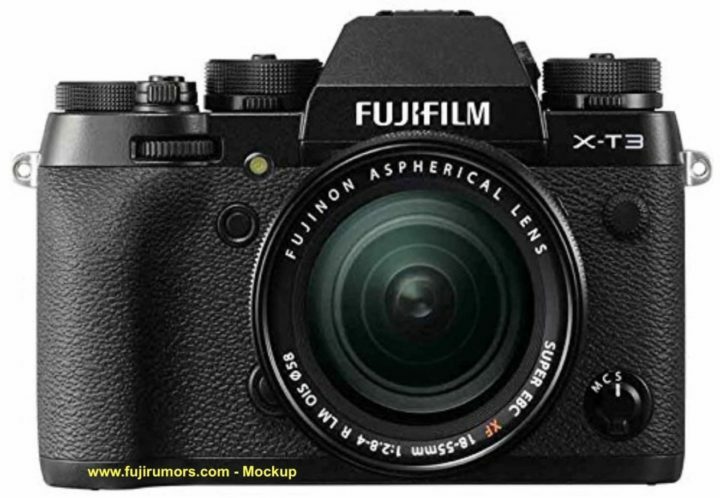 Are you happy with it, or would you prefer a secondary LCD monitor like on the Fujifilm X-H1 and Fujifilm GFX 50S? Let us know by voting the poll under the updated rumored specs list. As for the selfie screen, we already vote here. Fujifilm X-T3: Top LCD or Exposure compensation dial?